This compilation ℗ © 2000 Sony Music Entertainment (UK) Ltd. 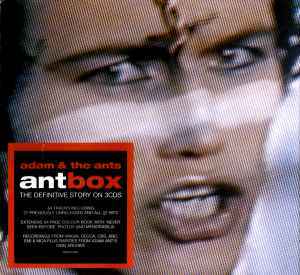 Released in December 2000 in a deluxe 7" size lid-top box complete with 48-page colour "antbook" booklet. Re-released in October 2003 in a CD-sized case with catalog number 500782 9. Track 1-9 is incorrectly spelled 'Liggotage' on the artwork. Track 3-5 is incorrectly indicated as the Single version (i.e. Blastoff Mix) but it is actually the shorter LP version. Track 3-11 is indicated as unreleased, but it is just a very poor copy of the same recording released in 1990 on Can't Set Rules About Love. Track 3-17 is incorrectly indicated as the Single version, but it is actually the longer LP version.